President Kate Dame and Treasurer Chuck Moran welcome newest Dracut Rotarians, (center l) Renee Plummer and (center r) Nanci Hill. 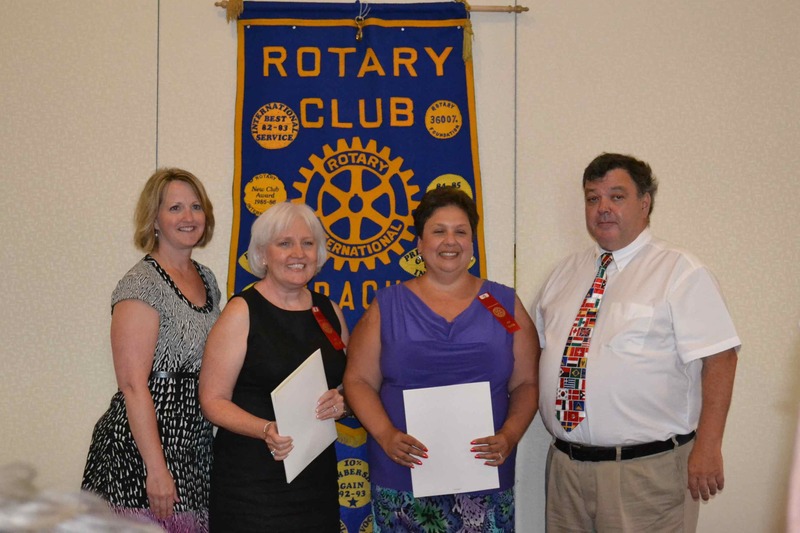 Dracut Rotary Club inducted its newest members, Renee Plummer and Nanci Hill, on July 11th. Club members, family and friends celebrated the occasion during a ceremony held at the Four Oaks Country Club in Dracut. DRC Treasurer, Chuck Moran, called on Renee and Nanci to commit themselves to the mission of Rotary – “Service Above Self” to our community, our region, our nation and the world. Chuck encouraged the new members to become immersed in the Club’s upcoming events. Renee is a Certified Public Accountant with a practice in Dracut specializing in small business and personal income tax. She and husband Don have lived in Dracut for 30 years, raising 3 children here. “I have enjoyed working in Dracut over the last ten years. Rotary provides me the additional opportunity to meet and work with other people in the town who are committed to giving back to the Dracut community,” said Renee. Nanci is the Director of the Moses Greeley Parker Memorial Library in Dracut. She serves on many local, state, and national library committees. In addition to her library work, she is also a published author.